RanDair Porter (vox,guitar), Rene Giust (bass,vox), Glenn Allen (lead guiar, vox), Patrick Coy (drums,vox) and Marco Longo (keyboard). Ransom and the Subset is an American alternative rock band based in Seattle, Washington. With a refreshing pop-rock sound, their music is clearly driven by strong melodies and well-crafted arrangements. 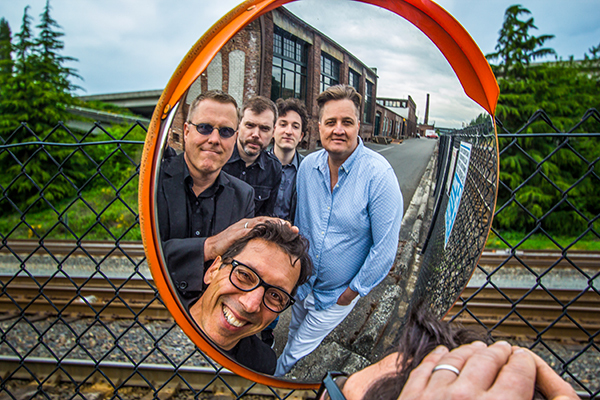 Along with infectious hooks and witty, insightful lyricism, Ransom and the Subset delivers a dynamic blend of power pop from decades past along with a strong element of modern rock. Over the course of a year, Porter flew to Boston to work with King and Carlisle on the album, making a stop in NYC where he worked with Jody Porter (Fountains of Wayne) as well. The famed artist contributed both guitar and bass guitar to the track “Sticking Onto You”. Intermixed with many flights across the country, Porter also sought out collaboration at home in Seattle. Luck and perseverance served in his favor, as he garnered the talent of great Seattle musicians like Jon Memolo, Mike Musburger (formerly of the Posies) on drums and Mike Squires (formerly with Harvey Danger) on bass guitar, providing the driving rhythm section for “Leaving With You”. Supporting the album are local Seattle musicians Giust, Coy, Allen, and Longo. Along with Porter these seasoned musicians put on an exciting performance masterfully demonstrate beautiful harmonies and superb musicianship. Along with touring the group is actively writing new pop gems and recording. Keith Olsen – Famed Producer of Rick Springfield, Fleetwood Mac, Foreigner, Pat Benatar, Sammy Hagar, Eddie Money, Six-time Grammy Award Winner, recipient of Billboard’s Top 5 Producers in the World, Lifetime Achievement Hollywood F.A.M.E. Award Winner.